This recipe is from a stash of old Kerr and Ball Jar canning recipes that were used by my husband’s great grandmother. Kiley’s mother gave me these amazing recipes and I cherish them so much. Hand written notes are in the margins and there are added notebook sheets browned at the edges and creased from use. His great grandmother was a 4′ 10″ strong, fiery, and amazing woman that believed in Sunday suppers with family and walking every day to the end of her drive way for exercise wearing large sunglasses and a large rimmed sun hat. I wish I would have known her. Especially since she would have been one of the only people that I would actually tower over. These recipes bring me back to a simple time. A time when families would have a garden in the backyard. Produce was fresh and “organic.” Except people didn’t have to call it organic, because why would they spray pesticides and chemicals on their own food. “Fast food” was reheating the leftover pot roast and green beans with new potatoes from Sunday’s supper. Oh ya…and it was supper, not dinner. Families sat down for supper together, a homemade meal that was made with love and the seasonal produce plucked from the backyard. No cell phones. No Facebook. No processed foods. Extra produce was canned or preserved in some way so that there was produce to eat in the winter. I made both the kosher dill pickles and a batch of bread and butter pickles. Both are amazing. 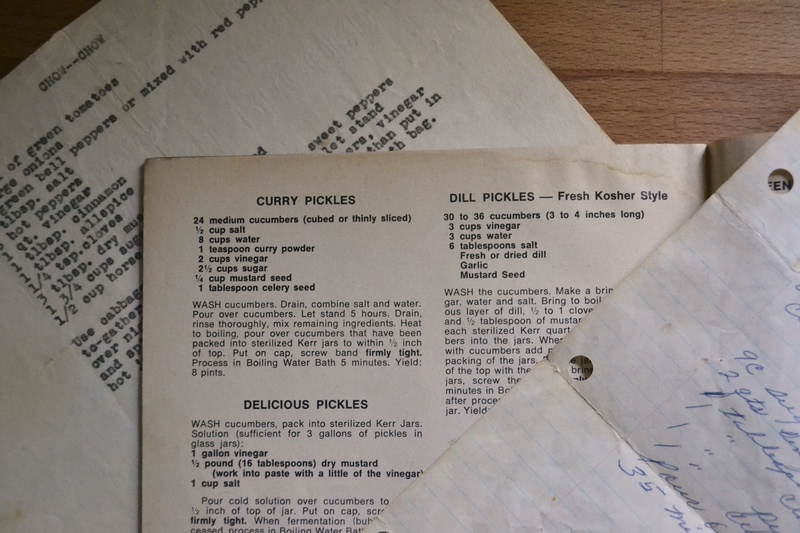 I’ve included the recipe for her kosher dill pickles which are amazing. You can adjust the heat depending on the quantity of red pepper flakes that you add. These are quick refrigerator pickles that don’t need to be canned. This is simple. Almost as simple as opening a jar of store bought. But so much more rewarding! 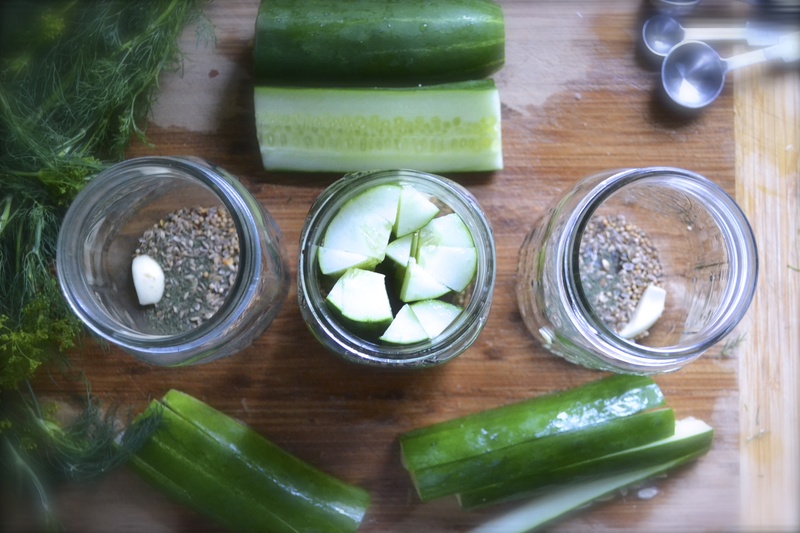 You will love to bring these pickles out at parties or take them to picnics or munch on them as a snack. So, you have a new assignment. You are making pickles. Use those extra cucumbers from the garden or gather up a bounty at the farmers market. Oh, get some fresh dill while you are at it. Make extra because your friends will want some and your family and your neighbors. Clean and sterilize 6 pint jars. I sterilize my jars in the dishwasher. In a medium saucepan, heat vinegar, salt, and water over medium heat until boiling. Remove from heat. Meanwhile, wash you cucumbers and slice lengthwise into spears or in 1/8-inch rounds. 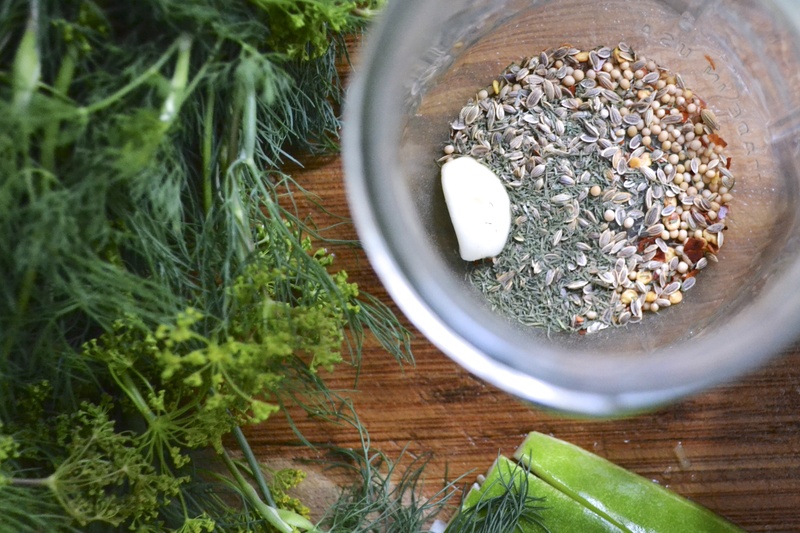 In the bottom of each sterilized pint jar, place 1 garlic clove (sliced or whole), 1/2 tablespoon dill seeds, 1/2 tablespoon mustard seeds, 1/2 teaspoon red pepper flakes (more or less depending on how spicy you want your pickles). 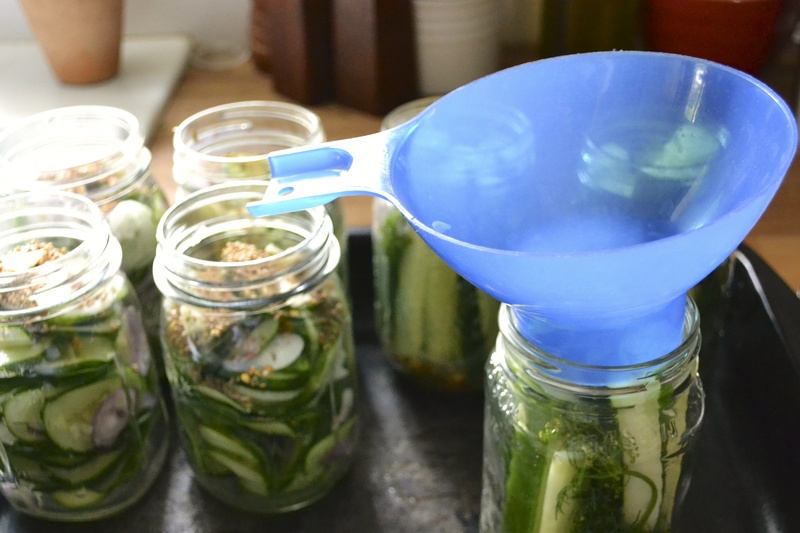 Stuff each pint jar with cucumbers. Layer fresh dill within the cucumbers. Pour liquid brine into each jar, leaving about 1/4-inch head space. Seal with lid. Refrigerate until cool, at least 8 hours. These improve over the week. Can be stored up to 4 weeks in the refrigerator. I’m stealing cucumbers from my dad next time I go home or I could purchase some at the farmers market. 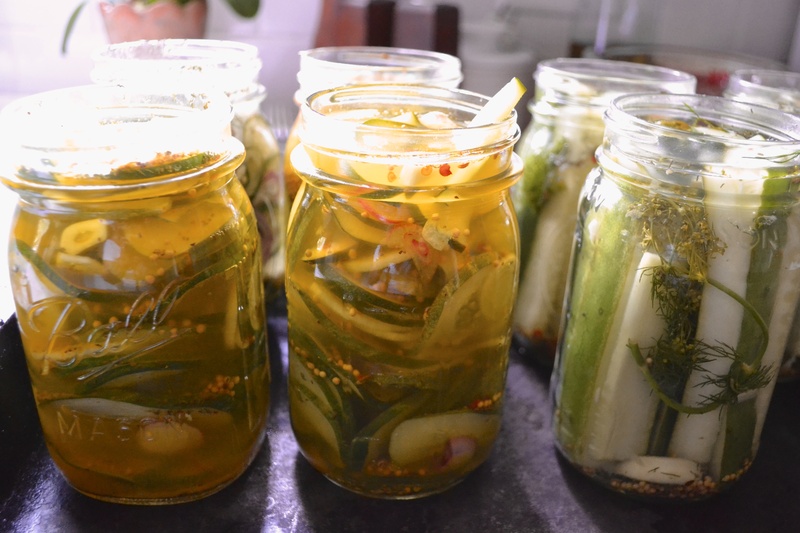 I HAVE TO MAKE THESE PICKLES! Haha. They will forever change your life!